Johnson County is a part of Kansas's 3rd congressional district, which elected Republican Kevin Yoder in the 2016 elections. The two U.S. Senators from Kansas are Republicans Pat Roberts and Jerry Moran. The most affluent county in Kansas, Johnson County is solidly Republican. President George W. Bush received 61% of the vote in 2004. Johnson County has not supported a Democrat on the Presidential ticket since Woodrow Wilson in the 1916 election. However, in 2016, Johnson County voted Republican by not even a three-point margin. Ward Parkway is a boulevard in Kansas City, near the Kansas-Missouri state line. It continues south for four miles, terminating at Wornall Road near West 95th Street, Ward Parkway has a wide, landscaped median, which is decorated with fountains and statuary. Many of Kansas Citys finest large houses are along Ward Parkway in the Country Club District. The street name derives from the family of pioneer Seth E. Ward who owned property on both sides of the parkway and whose house at 1032 West 55th St. is on the National Register of Historic Places. 39°02′22″N 94°35′07″W Southern terminus, Wornall Road 38°57′33″N 94°35′44″W Ward Parkway was created as part of developer J. C. Nicholss overall plans for the Country Club District, as Nichols platted the district, beginning in 1906, he reserved space for Ward Parkway. The largest lots in the district were reserved for houses to be built along the boulevard, the Kansas City Parks Department added Ward Parkway into its formal boulevard system. Nichols traveled to Italy and England to buy statues and monuments to place in the wide median. He placed ponds and decorative urns throughout the parkways length, to promote his development, Nichols periodically placed photographs of the large houses being built along Ward Parkway in Sunday editions of the Kansas City Star. Nichols even moved into a house just off Ward Parkway, on West 55th Street. By the time Evan S. Connell wrote Mrs. Bridge in 1959, around that time, a sociological research study undertaken by the University of Chicago determined that Ward Parkway and its vicinity was the most desirable neighborhood in all of Kansas City. One project that benefited from the District is the Ward Parkway Center, in addition, the city allocated more than $9 million for the maintenance and improvements of park grounds and monuments, and recreational facilities along parkways. Several sites and buildings along Ward Parkway are designated as National Historic Sites and are listed on the National Register of Historic Places, in 1996, design guidelines for building along the parkway were adopted, and new construction on the parkway requires a certificate from the Historic Preservation Committee. Prairie Village is a city in Johnson County, United States, and part of the Kansas City Metropolitan Area. As of the 2010 census, the city population was 21,447, after the successful development of the Country Club Plaza in Kansas City, Missouri, J. C. Nichols turned toward development of his native Johnson County, just a few miles from the Plaza. Prairie Village was platted in 1941 and was named after Prairie School, in 1949, Prairie Village was named the best planned community in America by the National Association of Home Builders. It was officially recognized as a city in 1951, remnants of the Santa Fe Trail are found in the city. Shawnee and Kansa Indians formerly owned the now developed into the City of Prairie Village. As settlers and pioneers headed west, one family decided to make Prairie Village their home, in 1858, Thomas Porter bought 160 acres of farmland. Porter’s children were all raised on this farmland and were engaged in agricultural development and it wasn’t just the Porter family who helped to make Prairie Village home. Porter’s sister, Betty Porter, married Thompson A. Lewis who owned 80 acres between Mission and Roe, henry Coppock arrived in Johnson County, in 1857, before heading further west to work in freighting and farming. He came back in the mid-1860s and bought land in 1865, Coppock built his family home on 900 acres in Prairie Village. Coppocks’s home stood for 30 years, now on his land is Homestead County Club. The original Prairie School was built in 1882 and a new building was constructed in 1912 and this landmark was a community treasure until 1990. In the 1940s, J. C. Nichols, an experienced developer, Nichols bought the farmland from the Porters and Lewises. There were hurdles along the way including a lack of experienced builders post World War II, Prairie Village continued to expand as the Prairie Village Shopping Center opened in 1947 and the Corinth Square Shopping Center opened in 1955. As of the census of 2010, there were 21,447 people,9,771 households, the population density was 3,459.2 inhabitants per square mile. De Soto /dəˈsoʊtoʊ/ is a city in Johnson and Leavenworth counties in the U. S. state of Kansas, and part of the Kansas City Metropolitan Area. The vast majority of the city,11.13 sq. mi. lies within Johnson County, as of the 2010 census, the city population was 5,720, and the 2015 census estimate is 6,074. The area code is 913, and the two zip codes are 66018 and 66019, De Soto began in the spring of 1857, named for sixteenth-century Spanish explorer, Hernando De Soto. In 1858, John Possum, a Shawnee Indian, and Hattie Possum sold 80 acres to John F. Legate, S. Todd and Stratton, the next sale was 80 acres to the De Soto Town Company in July 1861 for $1,176. Abbott is remembered as one of the towns pioneer landowners and the builder of Abbot Hall, Abbot Hall is one of two town museums. With the construction of the 9,080 acre Sunflower Army Ammunition Plant south of De Soto, in May 1943, The Kansas City Star article reported a town rapidly growing, with a population increase from 400 to 1,000 persons in under a year. Production flowed steadily at the Sunflower Army Ammunition Plant until the plant went on standby in March 1948, with small scale production following shortly after until its closure in 1993. In mid-July 1951, heavy rains led to a rise of water in the Kansas River and other surrounding areas of the central United States. De Soto, being along the Kansas River, was severely damaged, the river crest at De Soto was recorded at 24.87 feet. Most of the area was completely flooded, with over 2 feet of standing water in some places. Lexington Lake Park is under construction and is expected to open just west of De Soto by mid-2017, when completed this park will be the third-largest park in Johnson County. Arbor Ridge subdivision is a development which will enter phase 2 in 2017, allowing construction of 46. De Soto is located at 38°57′54″N 94°57′44″W along the Kansas River, according to the United States Census Bureau, the city has a total area of 11.20 square miles, of which,11.07 square miles is land and 0.13 square miles is water. He earned a great deal of notoriety in his own time, much of it bolstered by the many outlandish - often fabricated - tales he told about his life. Some contemporary reports of his exploits are known to be fictitious but, along with his own stories, remain the basis for much of his fame and reputation. Hickok was born and raised on a farm in northern Illinois, at a time when lawlessness and he fought and spied for the Union Army during the American Civil War and gained publicity after the war as a scout, marksman and professional gambler. Over the course of his life, he was involved in several notable shootouts, in 1876, Hickok was shot from behind and killed while playing poker in a saloon in Deadwood, Dakota Territory, by Jack McCall, an unsuccessful gambler. The hand of cards which he held at the time of his death has become known as the dead mans hand. Hickok remains a figure in frontier history. His father was said to have used the house, now demolished. He was the fourth of six children, William Hickok died in 1852, when James was 15. Hickok was a shot from a young age and was recognized locally as an outstanding marksman with a pistol. Photographs of Hickok appear to depict dark hair, but all contemporaneous descriptions affirm that it was red, in 1855, at age 18, James Hickok fled Illinois following a fight with Charles Hudson, during which both fell into a canal. 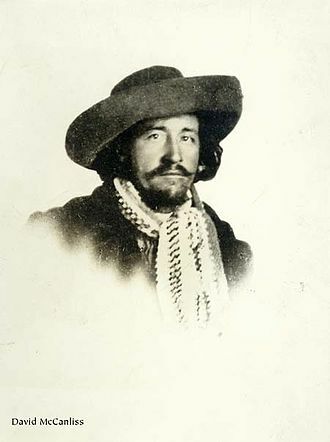 Hickok moved to Leavenworth in the Kansas Territory, where he joined General Jim Lanes Free State Army, a vigilante group active in the new territory. While a Jayhawker, he met 12-year-old William Cody, who despite his youth served as a scout just two years for the U. S. Army during the Utah War. 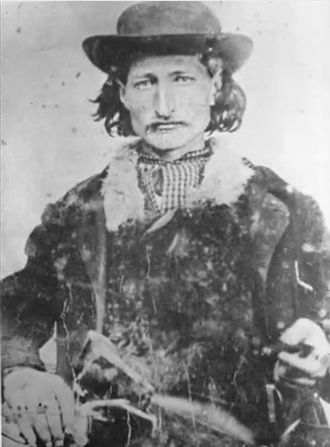 While in Nebraska, James Hickok was derisively referred to as Duck Bill for his long nose and he grew a moustache following the McCanles incident and in 1861 began calling himself Wild Bill. He was known before 1861 by Jayhawkers as Shanghai Bill because of his height, Hickok used the name William Hickok from 1858 and William Haycock during the Civil War. He was arrested using the name Haycock in 1865. Wyandotte County is a county located in the U. S. state of Kansas. As of the 2010 census, the population was 157,505 and its county seat and most populous city is Kansas City, with which it shares a unified government. Wyandotte County lies immediately west of Kansas City, the county is named after the Wyandot Indians. They were called the Huron by the French in Canada, and they were distantly related to the Iroquois, with whom they sometimes fought. 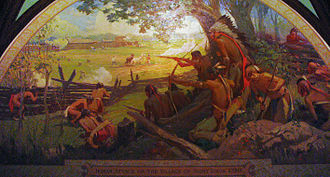 They had hoped to hold off movement by white Americans into their territory and had hoped to make the Ohio River the border between the United States and Canada, one branch of the Wyandot moved to the area that is now the state of Ohio. 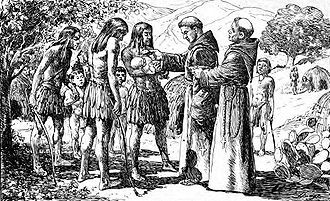 They generally took the course of assimilation into Anglo-American society, many of them embraced Christianity under the influence of missionaries. They were transported to the current area of Wyandotte County in 1843, the Christian Munsee influenced early settlement of this area. The Wyandot in Kansas set up a form of government that they had devised in Ohio. 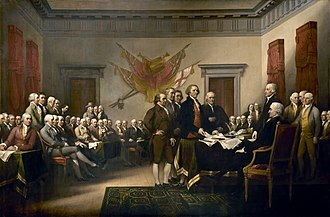 They set up the government for Kansas and Nebraska. It was one of their own who was elected as territorial governor, the county was organized in 1859. Tenskwatawa, the Prophet, fought at the Battle of Tippecanoe in 1811 and he was buried at Shawnee Native American historical site Whitefeather Spring. The Kansas City Smelting and Refining Company employed over 250 men during the 1880s, the ore and base bullion is received from the mining districts of the mountains and is here crushed and refined. 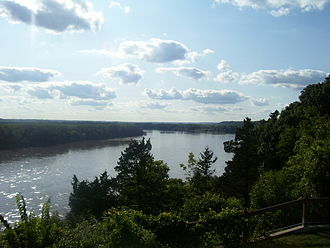 The Delaware Crossing was where the old Indian trail met the waters of the Kaw River, circa 1831, Moses Grinter set up the Grinter Ferry on the Kansas River here. His house was known was the Grinter Place, the ferry was used by individuals traveling between Fort Leavenworth and Fort Scott on the military road. Others would cross this area on their way to Santa Fe, the Diocese of Leavenworth moved its see from Leavenworth, Kansas to Kansas City, Kansas on 10 May 1947. It became an Archdiocese on 9 August 1952, according to the U. S.
Olathe is a city in, and is the county seat of, Johnson County, United States. Located in northeastern Kansas, it is the fourth most populous city in the state, Olathe is the fourth-largest city in the Kansas City metropolitan area. 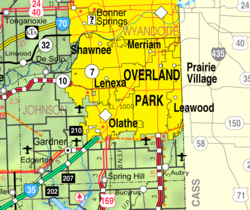 It is bordered by the cities of Lenexa to the north, Overland Park to the east, De Soto to the northwest, Olathe was founded by Dr. John T. Barton in the spring of 1857 and he rode to the center of Johnson County and staked two quarter sections of land as the town site. He described his ride to friends. the prairie was covered with verbena, I kept thinking the land was beautiful and that I should name the town Beautiful. Purportedly, Barton asked a Shawnee interpreter how to say Beautiful in his native language, Olathe was incorporated as a city in 1857. While Olathe was not the first city established in Johnson County, the citys early days were filled with violence, as pro-slavery forces from nearby Missouri often clashed with local abolitionists. 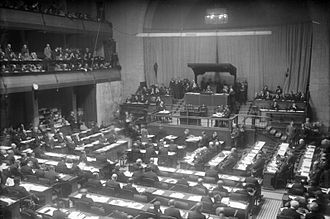 These conflicts were known on a scale as Bleeding Kansas. As the 1850s came to a close, and as Kansas entered the Union as a state in 1861. 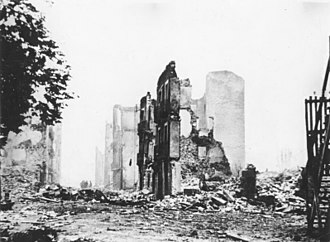 Quantrill launched the raid because the people of Olathe were known for their abolitionism, throughout the Civil War a military post operated in Olathe. The post probably was established in 1861 and was located on the square on which the Johnson County Courthouse has sat since that time. In March 1862 one company of troops were known to have been stationed there, when Quantrill raided Olathe on September 6,1862, more than 125 Union soldiers, almost all of them recruits, were there. They surrendered to Quantrill and were compelled to take an oath forbidding them from taking up arms against the Confederacy, Kansas militia occupied the Olathe military post through much of the Civil War and Army troops were there much of the time, as well. Twice more Olathe was threatened by Confederates, on August 20–21,1863, Quantrill again passed through the area when he raided Lawrence, Kansas. Many Union troops moved into and out of Olathe on those two days, the second time was on October 24-5,1864, when Confederate Maj. 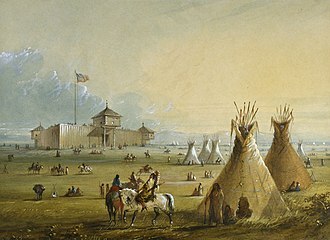 The Santa Fe Trail was a 19th-century transportation route through central North America that connected Independence, Missouri with Santa Fe, New Mexico. Pioneered in 1821 by William Becknell, it served as a commercial highway until the introduction of the railroad to Santa Fe in 1880. Santa Fe was near the end of the El Camino Real de Tierra Adentro which carried trade from Mexico City. 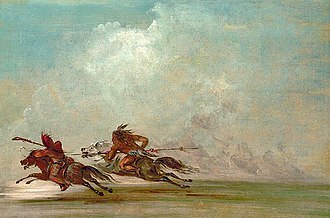 Comanche raiding farther south in Mexico isolated New Mexico, making it dependent on the American trade. 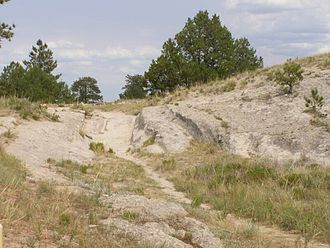 The Trail was used as the 1846 U. S. invasion route of New Mexico during the Mexican–American War, the road route is commemorated today by the National Park Service as the Santa Fe National Historic Trail. The trail was used to manufactured goods from the state of Missouri in the United States to Santa Fe. Santa Fe was near the terminus of El Camino Real de Tierra Adentro. This limited trade traffic transited the site that would become Fort Bent in Colorado and this post was only eight miles east of the site of Fort John on what became the Oregon Trail. The lost fort was on the site where Fort Bernard was founded in the eastern Oregon Country. That Fort Bernard ran cargo mule trains to the Santa Fe is historically certain, the earlier Fort and its traders are less so, and that gives weight that they might have been independents, and not employees of the large fur companies. Regardless of the lack of documents, it is known the light trading with Mexico used the trail. In 1825 the merchant Manuel Escudero of Chihuahua was commissioned by New Mexico governor Bartolome Baca to negotiate in Washington for opening U. S. borders to traders from Mexico. In 1835 Mexico City had sent Albino Pérez to govern the department of New Mexico as Jefe Politico, New Mexicans had grown to appreciate the relative freedoms of a frontier, remote from Mexico City. The rebels defeated and executed governor Albino Perez, but were ousted by the forces of Rio Abajo led by Manuel Armijo. The Republic of Texas claimed Santa Fe as part of the territory north, in 1841, a small military and trading expedition departed from Austin, Texas representing the Republic of Texas and their president Mirabeau B. The Country Club Plaza is a privately owned American shopping center in the Country Club District of Kansas City, Missouri. 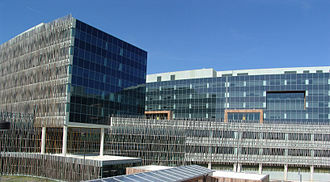 The center consists of 18 separate buildings representing 804,000 square feet of space and 468,000 square feet of office space. It was the first shopping center in the designed to accommodate shoppers arriving by automobile. The 55-acre site is four miles south of downtown, between 45th and 51st streets to the north and south and between Broadway and Madison Street to the east and west. The Kansas state line is one mile to the west, established in 1922 by J. C. Nichols and designed architecturally after Seville, the Plaza comprises high-end retail establishments and entertainment venues, as well as offices. The Country Club Plaza is named in the Project for Public Spaces list 60 of the Worlds Great Places, the Country Club Plaza was named for the associated Country Club District, the neighborhood developed by J. C. Nichols which surrounded the Kansas City Country Club. It is situated at the terminus of Ward Parkway, a boulevard known for its wide, manicured median lined with fountains. Nichols selected the location carefully to provide residents with a route to the Plaza along Ward Parkway. Nichols began acquiring the land for the Plaza in 1907, in an area of Kansas City that was known as Brush Creek Valley. Nichols employed architect Edward Buehler Delk to design the new shopping district, the Plaza opened in 1923 to immediate success, and has lasted with little interruption since that year. One of its oldest retailers is the Jack Henry Clothing company, on September 12,1977, a major flood of Brush Creek caused severe damage to the Plaza and resulted in a number of deaths. The flood prompted a vast renovation and revitalization of the area that has allowed it not only to survive, in 1998, the J. C. Nichols Company merged with Raleigh, North Carolina-based real-estate investment trust Highwoods Properties, who now runs the Country Club Plaza. On February 19,2013, an explosion destroyed JJs Restaurant on the Plaza. Believed to be caused by a gas leak, the blast left at least one person dead, according to a statement from Missouri Gas Energy, a contractor doing underground work struck a gas line. Shawnee /ʃɔːˈniː/ is a city located in Johnson County, United States, and part of the Kansas City Metropolitan Area. 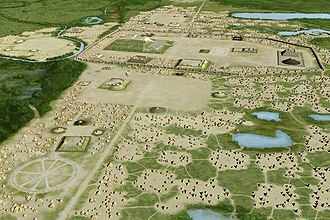 As of the 2010 census, the city population was 62,209, a Shawnee Indian mission had been established at the present site of Shawnee in 1831. Shawnee was laid out as a town in 1857, in 2010, Shawnee was recognized by Money Magazine in its annual Best Places To Live survey, placing 17th in the United States ranking. Shawnee was recognized for its housing, air quality index. Shawnee is located at 39°0′46″N 94°45′57″W, according to the United States Census Bureau, the city has a total area of 42.86 square miles, of which,41.85 square miles is land and 1.01 square miles is water. Shawnee Mission Park is a 1, 600-acre park that includes a 120-acre lake, according to the 2007-2009 American Community Survey the median income for a household in the city was $71,705, and the median income for a family was $86,408. Males had an income of $55,222 versus $41,960 for females. The per capita income for the city was $33,502, about 3. 6% of families and 5. 7% of the population were below the poverty line, including 6. 0% of those under age 18 and 4. 8% of those age 65 or over. As of the census of 2010, there were 62,209 people,23,651 households, the population density was 1,463.7 people per square mile. There were 24,954 housing units at a density of 587.1 per square mile. The racial makeup of the city was 86. 3% White,5. 3% African American,0. 4% Native American,3. 0% Asian,0. 1% Pacific Islander,2. 3% from other races, and 2. 6% from two or more races. Hispanic or Latino of any race were 7. 5% of the population,23. 1% of all households were made up of individuals and 6. 0% had someone living alone who was 65 years of age or older. The average household size was 2.61 and the family size was 3.11 persons. In the city, the population was out with 27. 7% under the age of 18,6. 9% from 18 to 24,28. 7% from 25 to 44,26. 6% from 45 to 64. The median age was 36.4 years, for every 100 females there were 97.8 males. For every 100 females age 18 and over, there were 95.8 males, according to the towns 2016 Comprehensive Annual Financial Report, the top employers in the city are, Shawnee has a council–manager government. The Missouri River is the longest river in North America. Rising in the Rocky Mountains of western Montana, the Missouri flows east and south for 2,341 miles before entering the Mississippi River north of St. Louis, Missouri. The river takes drainage from a populated, semi-arid watershed of more than half a million square miles. When combined with the lower Mississippi River, it forms the fourth longest river system. For over 12,000 years, people have depended on the Missouri River and its tributaries as a source of sustenance and transportation. 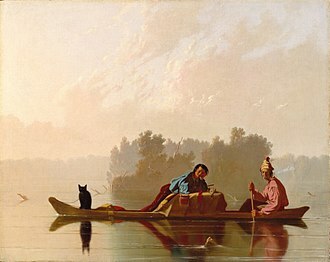 More than ten major groups of Native Americans populated the watershed, most leading a nomadic lifestyle, the Missouri River was one of the main routes for the westward expansion of the United States during the 19th century. The growth of the fur trade in the early 1800s laid much of the groundwork as trappers explored the region, pioneers headed west en masse beginning in the 1830s, first by covered wagon, by the growing numbers of steamboats entering service on the river. Former Native American lands in the watershed were taken over by settlers, leading to some of the most longstanding, during the 20th century, the Missouri River basin was extensively developed for irrigation, flood control and the generation of hydroelectric power. Fifteen dams impound the main stem of the river, with more on tributaries. Meanders have been cut and the river channelized to improve navigation, from the Rocky Mountains of Montana and Wyoming, three streams rise to form the headwaters of the Missouri River. The longest begins near Browers Spring,9,100 feet above sea level, on the southeastern slopes of Mount Jefferson in the Centennial Mountains. Flowing west north, it runs first in Hell Roaring Creek, west into the Red Rock, swings northeast to become the Beaverhead and these two streams flow north and northwest into Montana. The Missouri River officially starts at the confluence of the Jefferson and Madison in Missouri Headwaters State Park near Three Forks, the Missouri passes through Canyon Ferry Lake, a reservoir west of the Big Belt Mountains. The Giralda Tower, inspired by the original at the Cathedral of Seville.